In this assignment you will implement a fully functional Internet router that routes real network traffic. The goal is to give you hands-on experience as to how a router really works. Your router will receive raw Ethernet frames. It will process the packets just like a real router, then forward them to the correct outgoing interface. Your job is to create the forwarding logic so packets go to the correct interface. 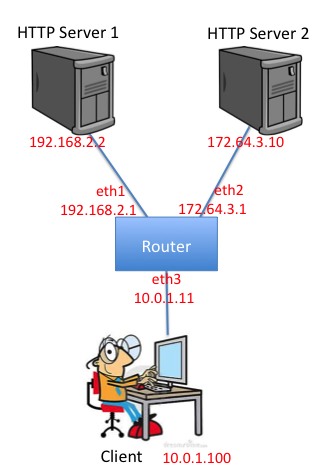 Loading routing table from server, clear local routing table. This sr_solution has the function that you need to finish. With sr_solution running, you can run ping, traceroute, wget correctly from the client xterm. To run your own code, you will want to kill the sr_solution program, and run your own instead. Pinging from the client to any of the router's interfaces (192.168.2.1, 172.64.3.1, 10.0.1.1). Downloading a file using HTTP from one of the app servers The majority of the code which makes the router work is provided for you. in sr_handlepacket():parse the provided ethernet frame, verify that it is valid and to this interface, and call handle_ip() or handle_arp() as needed. in handle_arp(): handle incoming ARP requests by sending a reply if necessary. in handle_ip(): verify the validity of the IP header, handle packets destined for the router (only ICMP Ping must be handled, all data packets should receive an error response), and forward/drop packets NOT addressed to this router as appropriate. in rtable_find_route(): find the best route in the routing table, and return a pointer to that element in the linked list of routing table entries. in router_queue_ethernet_frame(): craft an outgoing ethernet packet based on the given payload, source, and destination, and send it out via sr_send_packet. in network_send_packet_from(): allocate a new IP packet, set its headers and payload correctly, and call router_send_ethernet_frame to send it along. in icmp_send(): allocate, fill, and send a new ICMP packet using network_send_packet or network_send_packet_from. If the src ip is null, you can use network_send_packet to set the src ip based on the routing decision for the destination. in handle_arpreq(), for waiting packet on a arp request, first check whether it has been timeout, if so, send icmp host unreachable ICMP packet to the source, then clear the request in arp cache; if not, send a new arp request and update the valid time and send times. Within the sr framework you will be dealing directly with raw Ethernet packets. There are a number of resources which describe the protocol headers in detail, including Stevens UNP, www.networksorcery.com and the Internet RFC’s for ARP (RFC826), IP (RFC791), and ICMP (RFC792). The stub code itself provides some data structures in sr_protocols.h which you may use to manipulate headers. There is no requirement that you use the provided data structures, you may prefer to write your own or use standard system includes. non-ICMP messages sent directly to routers receive an 'ICMP Protocol Unreachable' message in reply. the only ICMP message you must reply to is ICMP Ping. all ARP packets must be for the Ethernet hardware type and IP protocol type. Only ARP Requests and ARP Replies are to be processed. You can log the packets receives and generated by your SR program by using the "-l" parameter with your SR program. The file will be in pcap format, i.e., you can use wireshark or tcpdump to read it. print_addr_ip_int(uint32_t ip) - Prints out a formatted IP address from a uint32_t. Make sure you are passing the IP address in the correct byte ordering. To find more information, you can access https://github.com/mininet/mininet/wiki/Simple-Router. But do not use the template code it provedes, it's not compatible with our mininet version.